Phillips, E. M. and A. Walker. 2002. Fossil lorisoids. Pages 83-96 in The Primate Fossil Record. W. C. Hartwig, ed. Cambridge Univ. Press, Cambridge, U.K.
Rasmussen, D. T. and K. A. Nekaris. 1998. Evolutionary history of lorisiform primates. Folia Primatologica 69 (Suppl. 1):250-285. Seiffert, E. R., E. L. Simons, and Y. Attia. 2003. Fossil evidence for an ancient divergence of lorises and galagos. Nature 422(6930):421-424. Seiffert, E. R., E. L. Simons, T. M. Ryan, and Y. Attia. 2005. Additional remains of Wadilemur elegans, a primitive stem galagid from the late Eocene of Egypt. Proceedings of the National Academy of Sciences (USA) 102(32):11396-11401. Yoder, A. D., J. A. Irwin, and B. A. Payseur. 2001. Failure of the ILD to determine data combinability for slow loris phylogeny. Systematic Biology 50:408-424. Galagonidae (Galagos, Bushbabies). University of Michigan Museum of Zoology Animal Diversity Web. 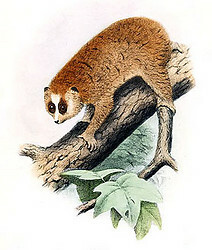 Loridae (Lorises, Slow Lorises, Pottos, Angwantibos). University of Michigan Museum of Zoology Animal Diversity Web.